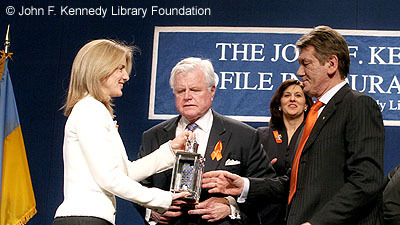 Left to right: Caroline Kennedy Schlossberg, Senator Edward Kennedy, President Viktor Yushchenko. Thank you Paul Kirk for that gracious introduction. Paul has been a great friend of the Kennedy family and the Kennedy Library for many years. We're honored by his friendship, and grateful for all he's done to support the Profile in Courage Award over the years. In "Profiles in Courage," President Kennedy wrote: "A man does what he must - in spite of personal consequences, in spite of obstacles and dangers and pressures - and that is the basis of all human morality." Our honoree this evening vividly embodies my brother's words, and is renowned throughout the world for his extraordinary courage. As we all know, at a critical moment in his nation's history, he took a strong and courageous stand for what he knew was right. He risked his life - and nearly lost it - in the ongoing struggle for democracy in Ukraine. His story is the story of honor, decency, and the will of the people triumphing over fraud, deceit and intimidation. And because of his great courage, the rule of law prevailed against the oppressive rule of the powerful over the powerless. A few months ago, the world held its breath as the "Orange Revolution" took place in Ukraine. We were transfixed by the scenes of hundreds of thousands of demonstrators filling Independence Square in Kiev as Ukrainian citizens, young and old alike, defended the principle of free and fair elections against the mendacity and corruption of the old regime. Night after night, they stood tall in the bitter winter cold and warmed the hearts and minds of the world with their human chains that blocked access to government buildings. Throughout those dramatic and nerve-racking days of last fall, Viktor Yushchenko was their unquestioned leader and moral authority. He was clear about the ultimate goal - upholding the right of the Ukrainian people to choose their president freely and fairly. He was clear that non-violence was the only acceptable means to achieve that great goal. As he insisted to his supporters: "A path to a compromise through the people demonstrating their will is the only path that will help us find a way out of this conflict." The Orange Revolution succeeded because of his courage and the courage of the Ukrainian people. He won the new election, and became the third president of a free and independent Ukraine. He stood up for what he believed in, even in the face of direct threats to his personal safety. It is difficult to imagine a more dramatic example to the world of a true "profile in courage." Viktor Yushchenko was born in northeastern Ukraine into a family of teachers. He chose to pursue a career in finance, beginning as a village accountant and rising to ever-higher positions in the banking system of the former Soviet Union. He continued in that career when the Cold War ended and Ukraine gained its independence, and, in 1993, he became head of its national bank. His skillful management of Ukraine's monetary system led President Leonid Kuchma to name him Prime Minister in 1999, and he boldly pursued sometimes unpopular but needed reforms that laid the foundation for the impressive economic growth of Ukraine over the past five years. But others feared his rising popularity and in 2001 he was dismissed from the government. Refusing to be silenced, he became the head of a political party and helped create a bloc of reform parties called "Our Ukraine," which won a plurality of seats in the parliamentary elections of 2002 and became a significant force in the legislature. As the presidential election approached in 2004, it was obvious that he appealed to Ukrainian citizens in ways no other politician could. His popularity was higher than any others because he had the ability to relate to people's lives, and was so clearly seeking public office for the public good, not private gain. These qualities endeared him to the people, but made him a special threat to the corrupt leaders of the regime in power. Nothing - not even a vicious attempt to poison him - could break his spirit and prevent him from speaking out against corruption and for a democracy grounded firmly in the rule of law. During the presidential campaign last year, the playing field was anything but level. The government's candidate was supported by most of Ukraine's powerful politicians and business leaders, who were threatened by his strong anti-corruption stand. State-owned media shamelessly opposed him, and independent media were subjected to violence and intimidation in a largely successful effort to silence their support. Opposition rallies faced constant harassment. Government employees, factory workers and students were threatened with dismissal unless they opposed him. President Putin of Russia openly intervened by declaring his support for the government candidate and sending a team of his top political advisers to assist him. But perhaps the most alarming incident during the campaign occurred when Mr. Yushchenko became mysteriously ill, from what doctors later determined was an attempt to poison him. It took tremendous courage on his part and the part of his family to continue the campaign in spite of this vicious criminal act that threatened to take his life. The atmosphere of intimidation and corruption persisted throughout the campaign and the election itself. In the first round of balloting, international observers cited numerous problems and irregularities. Names were missing from voting rolls, and local election officials were excluded at the last minute from their posts. Nevertheless, Mr. Yushchenko prevailed by a small margin and advanced to the second round as the opposition candidate. As the stakes increased, so did the electoral fraud and abuse. Absentee ballots were falsified to inflate the government's support. Suspiciously high turnouts took place in key government strongholds. Intimidation and even violence occurred at polling places. In desperation, before the legal challenges were resolved, the election commission announced preliminary results showing its candidate had prevailed. In outrage and anger, Yushchenko supporters poured into the streets, their ribbons and scarves creating a sea of orange. They vowed court challenges, non-violent protests, and other civil disobedience to overturn the fraudulent result. Demonstrators in Kiev numbered in the hundreds of thousands and peacefully blocked the parliament and other government buildings. Secretary of State Powell's declaration that the United States did not "recognize the legitimacy of the results" also had a galvanizing effect. The Ukrainian Supreme Court prohibited official publication of the election result, pending its review of the charges of fraud. The parliament approved a resolution calling the election invalid, adopted a motion of no confidence in the election commission, and later adopted a motion of no confidence in the government. Finally, the Supreme Court declared the election invalid because of the widespread fraud, and ruled that there should be another vote. The parliament passed a series of reforms to reduce the chance of fraud. Mr. Yushchenko was the clear winner, and the people's will was vindicated. When he took the oath of office, hundreds of thousands of Ukrainians looked on, and people watched in awe throughout the world. In his inaugural address, he said: "We have already taken an irrevocable step towards democracy. Only democracy guards the most valuable things for every person - family and children, peace and order, work and well-being. Only in a democratic state are the highest values those of human dignity, freedom, equality and solidarity. Only in a democratic Ukraine can the bright palette of languages, cultures and views become the country's wealth." These dramatic events last fall marked a historic turning point in Ukraine's long journey. The path was difficult, but the people never abandoned their dream of a true democracy, and it was Viktor Yushchenko's unparalleled courage that made it possible. Ukraine's poet laureate, Taras Shevchenko, brilliantly wrote in 1845, in an earlier time of great ferment, "The spirit is immortal and free in spite of the tyrants, and human speech cannot be stifled." Because of our honoree, the people of Ukraine know that those words have great power in the 21st century as well. I know how much President Kennedy would have cherished this occasion. Rarely, if ever, in our time has there been a more vivid example of a Profile in Courage. Last weekend, several of us in the Kennedy family visited the church in Richmond where Patrick Henry made his famous appeal in March of 1775, urging the people of Virginia to join the people of Massachusetts in the struggle for independence. Responding to those who urged caution, he said: "It is vain, sir, to extenuate the matter. The gentlemen may cry, Peace, peace! But there is no peace… Our brethren are already in the field! Why stand we here idle?…Is life so dear or peace so sweet as to be purchased at the price of chains and slavery? Forbid it, Almighty God. I know not what course others may take, but as for me, give me liberty of give me death!" As I thought of those inspiring words, I wondered who President Kennedy would think best exemplifies their spirit today - the love of freedom and the courage to build a nation dedicated to that principle. I'm sure that President Kennedy would think of President Yushchenko. In his own Inaugural Address, my brother pledged that America would "pay any price, bear any burden, meet any hardship, support any friend, oppose any foe to assure the survival and the success of liberty." President Yushchenko has shown the world that there are extraordinary leaders who feel that way today, and who have the courage to live by them. He deserves our nation's admiration and strong support, and so do the Ukrainian people. Persons of good will throughout the world are heartened by his shining example that freedom, tolerance and hope are the common birthright of every human being on our planet. I know how much President Kennedy would have valued this moment, and we are honored that his daughter Caroline is here this evening to present this Profile in Courage Award. She's the inspirational leader for the library, an accomplished author in her own right, a devoted mother, and a powerful and eloquent symbol of the values her father cherished. It's a privilege to introduce her to you now - Caroline Kennedy. НАГОРОДА "ЗА МУЖНІСТЬ", 2005 р.
Шановний пане Пол Керк: дякую Вам за Ваш люб'язний вступ. Пол уже давно є щирим другом сім'ї Кенеді та бібліотеки Кенеді. Він робить нам честь своєю дружбою, і ми вдячні йому за все, що на протязі років зроблено ним на підтримку нагороди "За мужність". У своїй книзі "Профіль мужності" Президент Кенеді написав: "Людина робить те, що мусить робити - незважаючи на особисті наслідки, незважаючи на перешкоди, небезпеки й тиск - і це саме й є основою будь-якої людської моральності". Той, кого ми винагороджуємо сьогодні ввечері, являє собою яскраве втілення слів мого брата, і своєю надзвичайною мужністю він відомий по всьому світу. Як нам усім відомо, у критичний для своєї країни момент він непохитно й мужньо став на захист істини. Він ризикував власним життям - і майже втратив його - у сьогоднішній боротьбі за демократію в Україні. Його історія - це історія честі, пристойності та волі народу, що тріумфує над обманом, підтасовкою та залякуванням. І завдяки його великій мужності принцип верховенства закону подолав гніт сильних над безсилими. Кілька місяців тому світ затамувавши подих слідкував за розвитком драми під назвою "Помаранчева революція" в Україні. Ми були приковані до екранів сценами демонстрацій, у ході яких сотні тисяч народу заповнювали Майдан Незалежності у Києві, коли українські громадяни, молоді та літні, вийшли на захист принципу вільних і справедливих виборів від брехливості та корупції старого режиму. Щовечора вони гордо вистоювали на злому зимньому морозі, зігріваючи серця й розум людей усього світу тими живими ланцюгами, які перекривали доступ до урядових будівель. У ці сповнені драматичної та нервової напруги осінні дні Віктор Ющенко був для них незаперечним лідером і моральним авторитетом. Ясною для нього була кінцева ціль - ствердження права українського народу на вільне та справедливе обрання свого Президента. Ясною була також його позиція відносно того, що єдиним прийнятним засобом досягнення цієї великої цілі є ненасильство. Як він відзначив у словах, адресованих до своїх прихильників, "стежка до компромісу, що проходить через волевиявлення людей, є єдиною стежкою, яка допоможе нам знайти вихід із цього конфлікту". Помаранчева революція призвела до успіху завдяки його мужності та мужності українського народу. Він переміг у нових виборах, в результаті яких він став третім Президентом вільної і незалежної України. Він став на захист того, у що вірив, навіть перед лицем безпосередніх погроз у бік його особистої безпеки. Важко собі уявити більш драматичний приклад справжньої мужності для усього світу. Віктор Ющенко народився на північному сході України в родині вчителів. Він обрав собі кар'єру у фінансовій сфері, розпочавши трудову діяльність сільським бухгалтером і поступово піднімаючись сходинками службової драбини до більш високих постів у банківській системі колишнього Радянського Союзу. Він продовжував працювати на цій ниві й після того, як закінчилася холодна війна і Україна набула незалежності, і у 1993 році очолив її Національний банк. Його вміле управління фінансовою системою України призвело до того, що Президент Леонід Кучма в 1999 р. призначив його прем'єр-міністром. На цьому посту він сміливо продовжував іти курсом інколи непопулярних але необхідних реформ, що лягли в основу вражаючого економічного зросту України за останні п'ять років. Але у декого його зростаюча популярність викликала острах, і в 2001 р. Президент Кучма вивів його з уряду. Відмовившись мовчати, він очолив політичну партію і допоміг утворити блок реформістських партій під назвою "Наша Україна", який здобув більшість місць у парламентських виборах 2002 р. і став значною силою в законодавчому органі. Із наближенням президентських виборів 2004 р. стало очевидно, що його кандидатура приваблює громадян України так, як жодна інша. Його популярність перевищувала популярність будь-якого іншого політика, тому що він має здатність поставити себе на місце простих людей, і тому що він цілком очевидно намагався дістатися до громадської посади заради громадського добробуту, а не у корисних цілях. Ці якості привернули до нього народ, але зробили з нього особливу загрозу для корумпованих можновладців тогочасного режиму. Ніщо - і навіть злобна спроба його отруїти - не змогло зломити його дух і перешкодити його виступам проти корупції та за демократію, міцно засновану на верховенстві закону. В ході минулорічної передвиборчої кампанії кандидати знаходилися на явно різних умовах. Урядового кандидата підтримувала більшість провідних українських політиків і ділових керівників, для яких безкомпромісна позиція Ющенка в боротьбі з системною корупцією являла собою загрозу. Державні засоби масової інформації безсоромно протистояли йому, а незалежні ЗМІ були піддані переважно успішній кампаніїї залякування та насильства, метою якої було змусити їх мовчати. Збори й мітинги опозиції піддавалися постійним переслідуванням. Державним службовцям, робітникам заводів і фабрик та студентам погрожували звільненнями й відчисленнями у випадку, якщо б вони не виступали проти нього. Президент Росії Путін відкрито втрутився у хід подій, заявивши про підтримку урядового кандидата і надіславши на допомогу йому групу своїх найвправніших політичних радників. Але, можливо, найтривожніший інцідент у ході кампанії трапився, коли пан Ющенко захворів таємничою хворобою - що, як з'ясували пізніше лікарі, була наслідком спроби отруїти його. Для продовження кампанії незважаючи на злісний кримінальний акт, який міг коштувати йому життя, потрібна була непересічна мужність як з його боку, так і з боку його родини. Атмосфера залякування та корупції панувала не тільки у ході передвиборчої кампанії, але й під час самих виборів. Після першого туру голосування міжнародними спостерігачами були відзначені численні проблеми та порушення. Прізвища були вилучені зі списків виборців, а представники виборчої адміністрації на місцях були усунуті в останню хвилину. Незважаючи на це, пан Ющенко переміг із невеликою перевагою і просунувся до другого туру як кандидат опозиції. Ціна перемоги зростала, але водночас зростала й кількість обманів та порушень. Бюлетені для заочного голосування були підроблені, що повинно було забезпечити значно більшу підтримку уряду. Там, де уряд користувався підтримкою, процент людей, які прийшли до виборчої дільниці, був підозріло високим. На виборчих дільницях мали місце залякування і навіть насильство. З відчаю Центральна виборча комісія ще до того, як були розглянуті й вирішені юридичні позови, проголосила попередні результати, за якими їхній кандидат переміг. З обурення та гніву прихильники Ющенка вийшли на вулиці, і їхні стрічки та шарфи утворили помаранчеве море. Вони зобов'язувалися подавати позови до суду, організовувати ненасильницькі протести та інші акти громадянської непокори з тим, щоб відмінити нечесні результати. Демонстранти, які у Києві обчислювалися сотнями тисяч, установили мирну блокаду Верховної Ради й інших урядових споруд. Гальванізуючий вплив мало й висказування Держсекретаря Пауела про те, що Сполучені Штати не "визнають легітимності результатів". Верховний Суд України заборонив офіційну публікацію результатів виборів на час розгляду ним звинувачень у підтасовці. Рада ухвалила резолюцію, яка проголошувала вибори недійсними, прийняла вотум недовіри до Центральної виборчої комісії, а пізніше винесла вотум недовіри до уряду. Нарешті, Верховний Суд проголосив вибори недійсними з причини широкомасштабної підтасовки результатів і постановив, що повинно мати місце повторне голосування. Верховна Рада ухвалила ряд реформ із тим, щоб зменшити можливості підтасовки результатів. Пан Ющенко був однозначним переможцем, і це була перемога волі народу. Коли він складав присягу, вступаючи до посади, на нього схвильовано дивилися сотні тисяч українців і люди по всьому світу. У своїй промові під час вступу до посади він сказав: "Ми з вами вже зробили незворотний крок до демократії. Тільки демократія оберігає найцінніше для людини - родину і дітей, мир і спокій, працю і достаток. Тільки в демократичній державі найвищими цінностями є людська гідність, свобода, рівність і солідарність. Тільки в демократичній Україні яскрава палітра мов, культур і поглядів стане багатством цієї країни". Ці сповнені драматизму події минулої осені відзначили історичну поворотну точку на довгому шляху, який пройшла Україна. Той шлях був важким, але народ ніколи не облишав своєї мрії про справжню демократію, і безпрецедентна мужність Віктора Ющенка зробила її можливою. Улюблений український поет Тарас Шевченко блискуче написав у 1845 році, себто в інший час великих заворушень: "Дух безсмертний та вільний, незалежно від тиранів; слово не вдушити". Завдяки нашому лауреатові народ України знає, що ці слова мають велику силу і в двадцять першому столітті. Я знаю, як високо Президент Кенеді оцінив би таку нагоду. Рідко в наші часи можна знайти більш яскравий приклад мужності, та й невідомо чи можна взагалі. На минулі вихідні декілька членів родини Кенеді відвідали у Річмонді церкву, в якій Петрік Генрі у березні 1775 р. проголосив свій знаменитий заклик. У своєму зверненні він закликав населення Вірджінії приєднатися до боротьби населення Массачусетса за незалежність. Відповідаючи тим, хто закликав до обережності, він сказав: "Марно, пане, приглажувати стан справ. Ви, напевно, чуєте вигуки людей: "Мир! Мир!" Але миру немає... Наші брати вже на полі бою! Чому ж ми тут простоюємо незайняті? Чи таке дороге життя і чи такий дорогий нам мир, щоб купувати їх ціною ланцюгів і рабства? Боронь Боже милий... Не знаю, який шлях можуть обрати інші, але що стосується мене, то дайте мені волю, або заподійте мені смерть!" У той час як я розмірковував над цими натхненними словами, у мене виникло питання: хто на думку Президента Кенеді найкраще відображав би цей дух сьогодні - любов до свободи та мужність у розбудові народу, відданого цьому принципу? Я певний, що Президент Кенеді подумав би про Президента Ющенка. У своїй інаугураційній промові мій брат дав запевнення в тому, що Америка "заплатить будь-яку ціну, понесе будь-який тягар, впорається з будь-якими труднощами, надасть підтримку будь-яким друзям та вчинить спротив будь-яким ворогам, щоб забезпечити продовження й успіх справи свободи". Президент Ющенко продемонстрував світові, що у ньому є надзвичайні лідери, які плекають такі ж почуття й сьогодні, і які мають мужність жити згідно з цими словами. Він заслуговує на повагу й рішучу підтримку нашої країни; на це ж саме заслуговує і український народ. Його блискучий приклад надихає людей доброї волі по усьому світу, бо він показав, що ідеали свободи, терпимості й надії по праву народження належать кожній людській істоті на нашій планеті. Я знаю, як високо оцінив би цей момент Президент Кенеді, і великою честю для нас є присутність його дочки Керолайн, яка сьогодні ввечері вручатиме нагороду "За мужність". Вона керує бібліотекою, надихаючи її співробітників, сама є довершеним автором, відданою матір'ю, а також переконливим і красномовним символом цінностей, близьких до серця її батька. І я зараз маю привілей представити Вам Керолайн Кенеді.